The Shirley Chisholm Project of Brooklyn Women's Activism celebrates the life and mourns the passing of Basil Paterson; leading figure in New York State Politics, close friend, colleague and political collaborator. At the dedication of the Shirley Chisholm State Building in downtown Brooklyn, Paterson's son and former New York State governor, David recalled how Chisholm was often at the family's dinner table. The young David sat next to Chisholm, with whom he spoke about the importance of education and politics. He supported her 1972 presidential run. 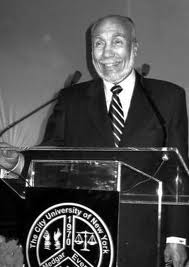 Paterson was born in Harlem on April 27, 1926 to Leonard James and Evangeline Alicia (Rondon) Paterson. His life intertwined with Chisholm on many levels. His parents were also Caribbean immigrants; with his father born on the island of Carriacou in the Grenadines and arriving to the United States by way of New York City aboard the S.S. Vestris in 1917, and his mother born in Kingston, Jamaica and arriving in the States by way of Philadelphia aboard the S.S. Vestnorge in 1919 with a final destination of New York City. The former Ms. Rondon once served as secretary for Marcus Garvey. Paterson became involved in Democratic politics in Harlem in the 1950s and 1960s. A member of the Gang of Four—with former New York Mayor David Dinkins, the late former Manhattan Borough President Percy Sutton, and Congressman Charles Rangel—Paterson has been a leader of the Harlem Clubhouse which has dominated Harlem politics since the 1960s. In 1965, along with Chisholm, Sutton, Rangel and Dinkins, Paterson founded the New York State Democratic Party’s Black and Latino Caucus, which is still active. In 1965, Paterson was elected to the New York State Senate representing the Upper West Side of Manhattan and Harlem, where he worked with Chisholm on a series of important legislative projects, including the passage of the SEEK (Seek Employment, Empowerment and Knowledge) Program. He gave up his Senate seat in 1970 to run for Lieutenant Governor of New York, the running mate of former U.S. Supreme Court Justice Arthur Goldberg. Chisholm decisively campaigned for Paterson to be on the ticket. The Goldberg/Paterson ticket lost to the Republic ticket of incumbent Governor Nelson Rockefeller and Lt. Gov. Malcolm Wilson. Later, Democrats had to grudgingly admit that Chisholm had been right in demanding Paterson be on the ticket. In 1978, Paterson was appointed as Deputy Mayor of New York City by then Mayor Ed Koch. He stepped down as deputy mayor in 1979 to become Secretary of State of New York—the first black person in the post—and served until the end of the Hugh Carey administration in 1982. Paterson is a member of the law firm of Meyer, Suozzi, English & Klein, P.C., where he co-chaired the firm’s labor law practice. Paterson is the father of former New York Governor, David Paterson, who was elected Lieutenant Governor in 2006 on a ticket with Gov. Eliot Spitzer. David Paterson succeeded to the governor’s office upon Spitzer’s resignation on March 17. David survives him, as does his wife Portia Hairston, their other son Daniel and five grandchildren. The honorable Basil Paterson was interviewed in 2012 for the Shirley Chisholm Project.